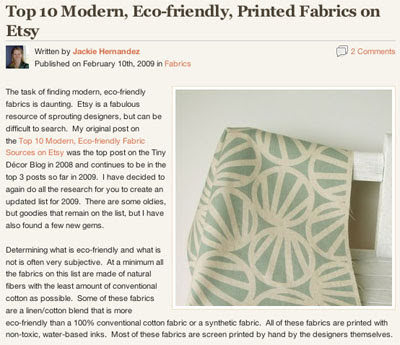 My fabrics are featured on “Crafting A Green World” along with my favourite handprinted fabrics by other artists on Etsy! Thank you Jackie! Hello. I didn’t know you had a blog till I read the post on Crafting Green. I’ve admired your Mari pillows in your etsy shop for some time, would love to buy some yardage in that design one day. :) I love how you show your workspace and tools in this blog, and how hands-on you seem to be about everything, building your own darkroom and even growing cotton, that made my jaw drop. Fun and inspiring – I’ll be popping in to visit again. Hi there! Thank you so much for your comment, I have visited your blog and find it interesting to know that you are interested in Japanese :) I have a magazine (called “around LINEN”) published by Fog Linen Work’s owner and it is very inspiring to me (I have met the owner once some time ago and she was a really nice person). Anyway, I just thought we have something in common in terms of what we are interested in and I really like the way you present your blog with those nice things! Thank you for visiting and for the compliment, Hitomi! I’m just starting out with my blog. By the way, I just saw that the Crafting Green article has been reproduced in Etsy’s Storque. Congrats!